Enter down the long and winding drive to your own private sanctuary. This peaceful property has everything you could ever want! 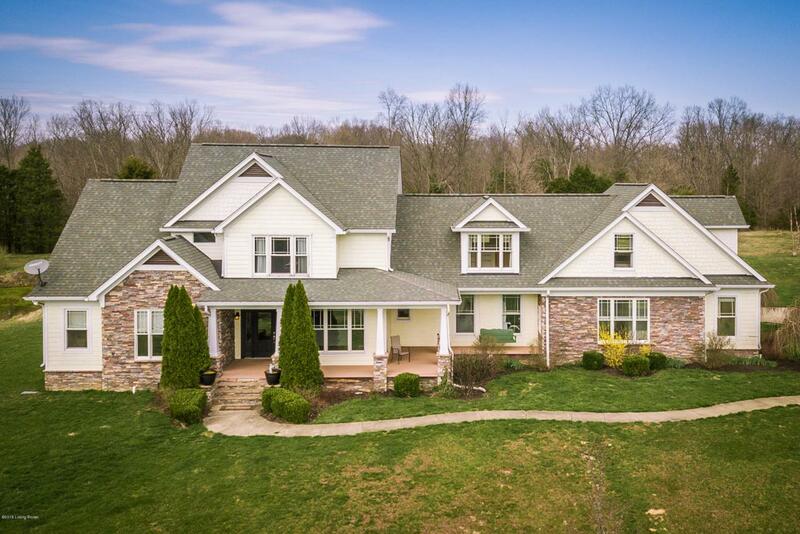 Situated on almost 18 acres in Oldham County, the home overlooks pastures, woods and stocked pond. This custom home is not your cookie cutter floor plan. Enter through the covered front porch into the foyer with crown molding and hardwood floors that opens to the great room that features fire place, built-ins, wall of windows and opens to the eating area. The chef's kitchen has shaker style cherry cabinets, stainless appliances and yards of granite with access to the formal dining room and the four season sunroom that has its own fireplace.The master suite handles king sized furniture with room to spare and the bath features a large shower, dual vanities and corner jetted tub. The separate rear entry of the home has a large working area with cubbies, desk, access to the garage, laundry room, rear staircase and also a second first floor bedroom and bath making it perfect for a home office or au pair! The second floor features 3 bedrooms, 1 which has a separate play area with closet, full bath, open sitting area with built ins and windows that makes a perfect paint spot, and a huge bonus room with windows on three sides. Though the basement, while not large, it has a family room and ample storage. Screened in porch on the back overlooks the play area and fire pit. The 37x47 barn has concrete floors, 2 stalls, 220 amp service as well as water making it perfect for your horses or hobby. The property is fully fenced and also features 2 paddock rings, over 1 mile of horse/ATV trails and a bridge over the creek. This home is a nature lovers dream and only 3 miles from the heart of LaGrange!